"As a result of yesterday’s meeting with the First Presidency I have been thinking and praying about my calling as Church Historian. This was also prompted by the necessity of writing an article appraising President Joseph Fielding Smith as a historian. On the one hand, I am the Church Historian and must seek to build testimonies, spread the word, build the Kingdom. On the other hand, I am called to be a historian, which means that I must earn the respect of professional historians—what I write must be craftsmanlike, credible, and of good quality. This means that I stand on two legs—the leg of faith and the leg of reason." Leonard James Arrington (July 2, 1917 – February 11, 1999) was an American author, academic and the founder of the Mormon History Association. He is known as the "Dean of Mormon History"  and "the Father of Mormon History"  because of his many influential contributions to the field. He was the first Church Historian for The Church of Jesus Christ of Latter-day Saints (LDS Church) from 1972 to 1982, and was director of the Joseph Fielding Smith Institute for Church History from 1982 until 1986. 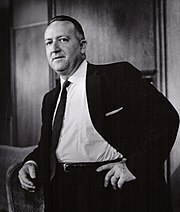 N. Eldon Tanner was made second counselor to the president of the LDS Church, David O. McKay, in 1963. 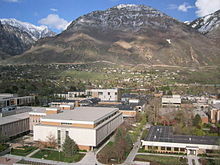 Tanner met with the director of the BYU library at the time, S. Lyman Tyler, to coordinate LDS historians' work with the LDS Church Archives. Arrington began attending these meetings in 1966. :100 In 1967, Arrington indicated that publisher Knopf was interested in publishing a general history of Mormons, and asked for unrestricted access to the LDS Church Archives, which he was granted in January 1968. ——; Thomas G. Alexander (1974). Dean L. May (ed.). A Dependent Commonwealth: Utah's Economy from Statehood to the Great Depression. BYU Press. ^ a b c d e f g h i j Findingaid authors: Matthew C. Godfrey and Jolyn Hunting (2014). " Leonard J. Arrington Papers, 1839–1999". Prepared for the Utah State University. Merrill-Cazier Library. Special Collections and Archives Manuscript Collection., Logan, UT. Retrieved May 24, 2017. ^ Hinton, Harwood; Spence, Clark C.; Hundley, Norris (January 1985). "Western History Association Prize Recipient, 1984: Leonard J. Arrington". The Western Historical Quarterly. 16 (1): 17–26. doi: 10.2307/968155. JSTOR 968155. ^ a b Bitton, Davis (1994). "Arrington, Leonard James". In Powell, Allan Kent (ed.). Utah History Encyclopedia. Salt Lake City, Utah: University of Utah Press. ISBN 0874804256. OCLC 30473917. Archived from the original on 9 January 2013.